The sky was an unbelievable shade of blue; some white blotches of cloud gently sailed over it, impersonating my first impressions of Pondicherry. 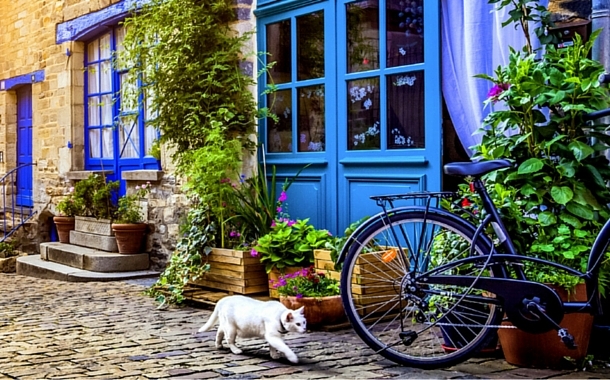 Beautiful French cafés, colourful façade, and colonial structures poised itself gracefully in the French street. The sweet aroma of Pondy instantly filled up my senses. While the French Quarters of Pondicherry kiss the shores, the fascinating Tamil Quarters impregnate structures of a distinct architectural style. Pondicherry is many things in one - it’s chilled-out, it leeks of history, it’s beautifully under-quoted by virgin beaches, and it is a sanctum of community peace and living. 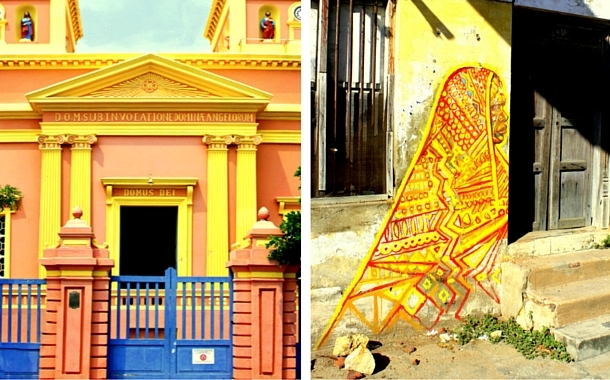 Pondicherry is coated with layers of pertinent living, brushed with strokes of human history. Having said so, Pondicherry flaunts Western as well as traditional Indian establishments. It is one of the best places to settle down in. It would be unjust to not talk about the Muslim, Christian, and Hindu Quarters in this area. I penetrated deeper into its handsomeness, in my quest to unfold its classical symphony. 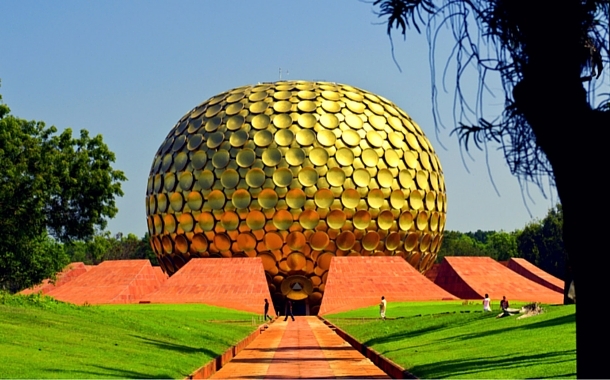 My unrestful soul sought abode in Auroville. A golden sphere rising on a pitch-green ground radiates a spiritual overtone on the entire township. In the sanctum of Matrimandir, there was nothing more conspicuous than silence, and nothing more louder than the nothingness of this silence. It is a reflection of community living, where one exchanges ideas and skills, imparts knowledge; for humanity is the only religion they believe in. A road trip to Pondicherry is not complete without a visit to the UNESCO World Heritage Sites at Mahabalipuram. If stones could talk, the sculptures of Mahabalipuram would reveal the fancies of our ancestral past. 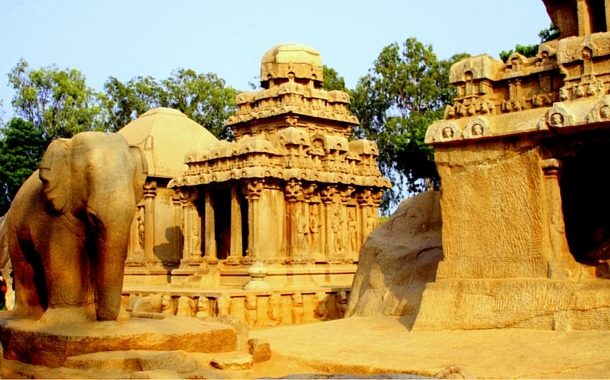 Welled up in heritage, history and culture, Mahabalipuram is an erstwhile port-city off the Coromandel coast. My guide Satheesh, must really be good at dramatics; his fluent narration took me back in time to the 7th and 8th century. Mahabalipuram has archived the glories of the Pallava dynasty in such a manifesting way that every sculpture draws parallel to its story with an irresistible longing of distinct possibilities. It was here in Mahabalipuram that I learnt that some histories are better off written in stones than textbooks. The sea water roared from behind these temples and a whiff of salinity bloated the air. The climax stirred an ocean of emotions. The sound of waves subsided, the clamour of tourists took over, shopkeepers and buyers bargained over pennies and I cached myself behind a distorted nandi sculpture to pen down a rush of thoughts. My attention was blurred when a foreigner called out to me and handed out a paper flown out of my bag - it was my air ticket back to Mumbai. Although I thanked him for his gesture, I felt heartsick as my trip was almost over. From the sweet scent of India’s colonial past to the royalties of its yesteryears, Pondicherry-Auroville-Mahabalipuram was truly a soul-stirring experience for me.